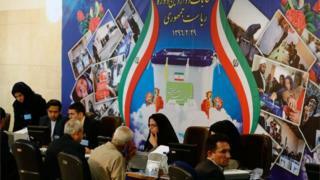 Iran is holding elections to choose its next president on 19 May. Here are the candidates standing for the post. The incumbent President, Hassan Rouhani, 68, is a smiling, soft-talking cleric. Born Hassan Fereydoun, he adopted the name Rouhani - which means spiritual in Persian - early in his career. Known for his sharp intellect and oratory, he famously holds a PhD in law from Glasgow Caledonian University. Mr Rouhani swept to power in 2013 promising reform and change. His biggest achievement so far has been negotiating a crucial 2015 deal to end the decade-long international stand-off over Iran's nuclear programme. The deal de-escalated dangerous tensions between Iran and the West and resulted in the partial lifting of sanctions. But the jury remains out about the economic benefits. Although the deal opened up Iran for business and contributed to what the IMF said was a massive 6.6% level of growth in 2016-17, there has not been a corresponding fall in unemployment. With joblessness now at 12.5%, and young people especially hard hit, this is likely to be key election issue for Mr Rouhani, whose support base includes many of the younger generation. Mr Rouhani is married and has four children. His immediate family keep out of the limelight, but his brother Hossein has represented him at the nuclear talks, and has also faced allegations of corruption from the president's hardline critics. Conservative cleric Ebrahim Raisi, 56, is the surprise candidate of this election. With a background in the judiciary, he has kept in the shadows and is not widely known by Iranians. He has close personal ties to the leadership of the Revolutionary Guard and as the favoured candidate of the hardliners, he is likely to be Mr Rouhani's key challenger. Mr Raisi holds a PhD in Islamic law and had a stellar rise through the ranks of the judiciary, becoming deputy prosecutor for the capital Tehran at the age of just 25. In 1988 he was one of four judges who sat on the so-called "death commissions" deciding the fates of thousands of opposition prisoners who were executed as their sentences came to an end. The executions are one of the most notorious and taboo subjects in Iranian post-revolutionary history and have never been officially investigated. The issue is unlikely to be raised in the state media during the election campaign, but is already being widely discussed on social media and by Persian-language media outlets based abroad. In March 2016 Mr Raisi was appointed head of one of Iran's most important and wealthy religious foundations - Astan Quds Razavi - with responsibility for overseeing the country's holiest Shia shrine in the city of Mashhad. It is a position of great prestige and influence, and led many to conclude that Mr Raisi was being groomed as a future successor to the Supreme Leader Ayatollah Khamenei. Some observers see his run for presidency as a dry run for his next job. If true, this is not a risk-free move. If he loses after a bitter campaign, it won't be easy to crown him as new leader any time soon. Little is known about Mr Raisi's private life except that his father-in-law is Ayatollah Ahmad Alamolhoda, the hardline Friday prayers leader in the city of Mashhad. There are two other contenders, although it's not clear if they will stay in the race to the final hurdle. Mostafa Mirsalim is an ultra-conservative figure who is supported by some of the most traditional conservatives. He was minister of culture in the mid-90s and was known for his harsh treatment of the independent media, closing a number of reformist publications. Mostafa Hashemitaba, is another lesser known figure. He was a minister of industries and mining in the 1980s and later became the head of National Olympic Committee of Iran. He tried his chance for presidency in 2001 but finished 10th out of 10 candidates, winning just 28,000 out of the 28 million votes cast in that election. * Mohammad Baqer Qalibaf withdrew on 15 May. Eshaq Jahangiri followed him on 16 May.